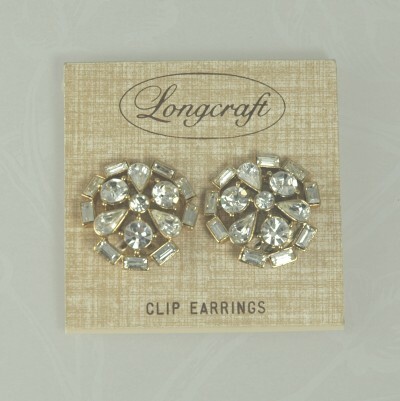 These classy earrings are on a Longcraft card. Longcraft was founded by Thomas Long in Boston MA, 1946. I bought the earrings this way and I cannot say if they belong on this card. No matter, they are beautiful earrings with crystal clear baguettes circling chatons and pear shaped rhinestones. They are slightly domed and I think they would be perfect for that special day! Condition: Excellent vintage. No signs of wear. Measurements: 1" in diameter.